Love, Mrs. Mommy: World Breastfeeding Week Giveaway! Over $224 in prizes! 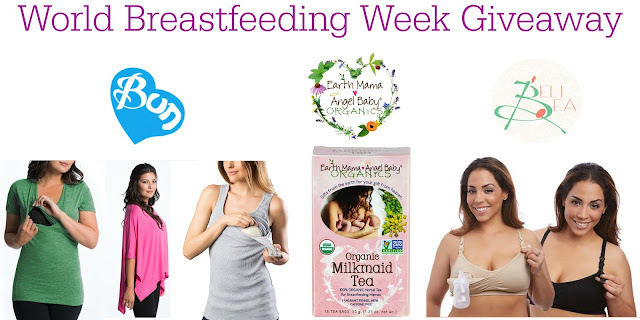 World Breastfeeding Week Giveaway! Over $224 in prizes! I am proud to be a part of this great giveaway to bring awareness and support to other mothers who are breastfeeding their baby, or are thinking of doing so. Enter for your chance to win! August 1st through August 7th is 2016's World Breastfeeding Week. 2016's theme is about how breastfeeding is a key element in getting us to think about how to value our well-being from the start of life, how to respect each other and care for the world we share. My breastfeeding journey has been one of the most precious times of my life. Supporting a mother who chooses to breastfeeding their child is key to their success. When a nursing mother is judged, shamed, denied time or a place to feed their baby it is not only effecting that child's growth but that mother's mindset of their breastfeeding experience. This week highlights a women choice to breastfeed and all things that go along with that choice. To celebrate this week MamatheFox is hosting a huge World Breastfeeding Week Prize Package Giveaway that includes a bra from BeliBea (nursing bra), a case of Milkmaid Tea by Earth Mama Angel Baby and (1) tank top, (1) tee shirt and (1) Breezy Poncho from Bun Maternity (nursing clothing). This package has a value of $224 and is open to US residents. Please complete the form below for your chance to win this amazing package.